Things are going really well here in Tampico. I feel like it's home and I'm enjoying almost everything about it. I say almost b/c i could do without the little critters we've had randomly----ewww....just little centipedes and ants---thankfully no cochroaches yet! Our maid comes to clean thursday--so hopefully with it even cleaner the bugs will be less. It's not bad, but even one big one a week is creepy! haha.. Speaking of a maid, it seems weird to have someone come clean an apartment:) but it's common here and honestly i definitely do not want to attempt mopping all the tile here!! Teaching is going well---I like my class--they are full of fun and laughter, and are pretty smart too. I'm still getting used to things like giving grades and dealing so much with parents but it is going well i think. I feel like the days go so fast! Today the kids were begging me to show them my foot---I went boot FREE this week!!! I finally could shove my foot into a normal shoe so i could start walking without the boot outside and at work! yay!! I feel so much freedom---that thing was heavy! Anyways, I told the kids i would show the scars to them if we could get through all the things i had planned for the last 30 minutes of the day today and at 1:55 I would let them see---they were so excited!! lol it was really funny in my head to think about. So i got great ooooooooooo's and ahhhhhhhhh's and ewwwwww's from them all. Then they left and a few asked if some of their friends could see too:) haha...gotta love little kids! 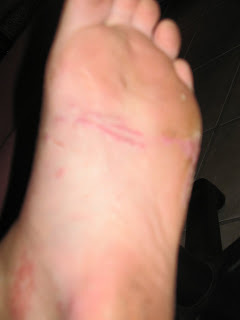 So here are the newest pictures of my foot. It's all closed up and healing well---of course i'll have the sweet scars for a while and my foot is still a little swollen but it feels fine! Preparations for Mexican Independence Day (Sept 16th) are already in the mix with invitations to dance lessons and a party. I guess we also dress up at school? I need to find out what to wear!!! :) Sounds like fun! I'm ready to dance now that i can wear shoes! Is there anything i miss from the USA? I think that is it for now---i'm trying to take pictures of me at school, or with friends---hopefully this week and weekend i can get some and post again soon! I'm so glad you're happy there Jules! ummmm.. I need to clarify a correction in you rlist of things you miss from the USA... number one should be... " My mommy and daddy!" right? Glad to hear you are doing well. About the TV-- you can always watch the non-English channels and make up your own stories! The kids and I used to do that. It's fun!